Participants in the lottery need to have a lot of luck. Predicting the right numbers is solely based on fate. This is what lotteries are all about. Take the Dutch Lotto, for example. As a player you have to predict the right numbers to win a big prize. People all over the world love to take a gamble and Lotto is incredibly popular. Almost every country organizes an own version, and so does the Netherlands. Buy ticket for The Lotto Holland. Lotto is one of the most popular games of chance in the Netherlands. The first Lotto draw took place in 1978, and it has been a success ever since. In the past decades the game has underwent some changes. What are these changes and how do they influence your winning odds? Some rules of the Lotto have been the same for years. Participants always have to choose their 6 lucky numbers from a range of 1-45. There are several ways to pick a number. Perhaps a random number brings you luck, but choosing your birth date or favorite number might help as well. Some participants look on the internet to see which numbers are being drawn often and which ones are not. They’re known as the ‘hot’ and ‘cold’ numbers. 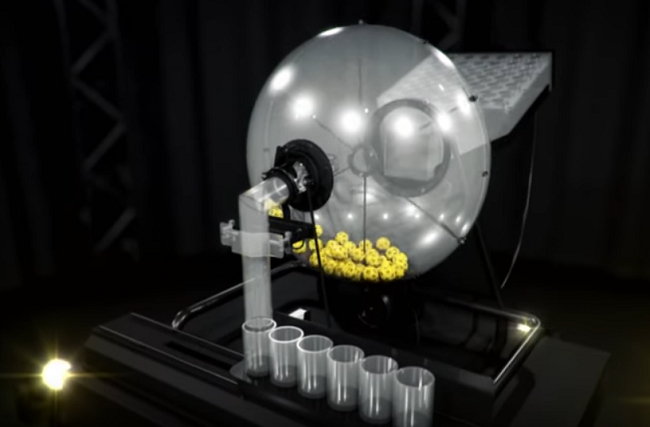 How does a Lotto draw take place? Recently, Lotto has underwent a small transformation. Several parts of the game have been changed. For example, the-so called ‘Lotto XL’ has been introduced, which gives players more chance to win. Participants now also have a chance to win the Super Saturday Price. A new element is an extra number. This extra number is especially important when you have less than 6 numbers correct. If it matches with the one on your ticket, you can still win big money. The 6 Jackpot colours have disappeared though. The colours aren’t used anymore because they decrease the winning chances. What’s more, now that they’re gone the chance to win the Jackpot has become 6 times as high! On December 9, 2017 another game will be added to this lottery: Lotto XL. It’s a new and exciting part of this popular game of chance. It’s an extra draw that takes place after the regular draw. Again six numbers and an extra number must match with those on your ticket to win a lot of money. A Lotto XL ticket only costs 1 euro more, so money is no issue. You play with the numbers from your standard ticket. It increases your chance to win more than a million euros! The Lotto draw takes place every Saturday. A moment hundreds of players have been waiting for. The last Saturday of the month is even more exciting, but then two Lotto XL draws are taking place. It’s called ‘Super Saturday’ for a reason! You can win big and small prize money, which varies from 100.000 euros to 20 or 5 euros. Every Lotto member has a chance to win big at Super Saturday. Perhaps you’re looking forward to this draw as well. Before it happens you receive a personal code. 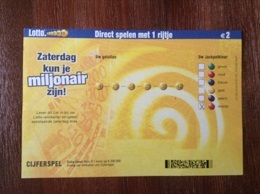 This code is part of your ticket and can be found in your account on www.lotto.nl. One of the most important questions when you participate in the lottery is ‘what are my winning chances?’. This depends on many factors. Obviously, the winning odds for the Jackpot aren’t the same as when you play with a free lottery ticket. Your chance to win the Jackpot is quite low, namely 1:163.580.00. However, this is only based on 7 numbers and 7 tickets. With 11 numbers and 462 tickets your winning chance is totally different, namely 1:17.630,00. With a free ticket the winning odds of 7 numbers and tickets are 4,49, whereas with 12 numbers and 924 this has decreased to 1,94. The winning odds also depend on the categories you’re playing in. Of course the odds for 6 numbers and the extra number are different than with 4 numbers. The first option has a winning chance of 45.379,620,00 when you play with 7 numbers and tickets whereas the odds for four numbers is 358. 62 in that case. There are a lot of numbers involved when you want to know the winning chance. You should check the statistics on the Lotto website to have a complete overview of the winning odds per number and ticket. The Dutch Lotto was established in 1957. In that year it organized the Toto for the very first time. However, it took until 1974 before the first Lotto draw was organized. Nowadays the Dutch Lotto works together with another well-known lottery called the Staatsloterij. Since April 1, 2016 both organizations work together as ‘The Dutch Lottery’. Other games of chance are part of the organization as well, including the Toto, Eurojackpot and het Miljoenenspel. Dutch Lotteries give a lot of support to charities. The Dutch Lotto is one of them. It especially focuses on sports. Actually, 37 percent of the total revenue is donated to the sport organization NOC*NSF. It supports top sport in the Netherlands. Another part of the revenue is meant for the ‘Stichting Aanwending Loterijgelden Nederland’. This foundation gives an incredible amount of money to hundreds of charities and sport federations. Among them are the Diabetes Fund, the Brain Foundation and the Kidney Foundation. By supporting many charities the Dutch Lotto wants to give back something good to society. Good job! Not all the lotteries of Lotto are the same. Most of the time there are some small differences, like the range of numbers you could choose from. Sometimes it’s 1 to 25, but 1 to 50 is also a possibility. It’s the same case for the bonus. Whereas some lotteries use a number, others prefer a colour. The maximum prize of the Jackpot and other prize categories could be different as well. The Dutch Lotto uses the numbers 1 to 45 to choose from. Instead of a bonus number you have to pick an extra colour. You win the Jackpot when all the numbers and the colour are predicted correctly. However, there’s also prize money for players who have it partially right. It’s really easy to participate in the Dutch Lotto. You only need to buy a ticket in one of the Lotto sellingpoints. The Primera is a good shop to do so. You’ll find this store in many Dutch places. You receive a sheet to play. However, in the past few years more people have been playing the Dutch Lotto online or with an app. The biggest advantage is the fact that your prize money will be added to your account immediately. Otherwise you need to go to the store. Besides that, as a player you receive an automatic message when you’ve won. Luckily, tickets for the Dutch Lotto are not every expensive. A ticket for just one prediction costs 2 euros. So everyone can participate as much as they want. Perhaps you like this game so much that you want to play it more often. A subscription might be a good choice. Or buy a bundle that gives the possibility to participate in several draws. Sometimes you even enjoy a nice discount with a bundle of benefits. For example, you can play seven times and pay for only six. You can play in as much draws as you want. The amount of money you win depends on the right numbers and the colour. The Dutch Lotto uses nine prize categories in total. You’ll be added to the first category if you’ve predicted all the numbers correctly but the wrong colour. No worries, because you still win main prize of 1 million euros! Category 2 is meant for the players who predicted 5 correct numbers and the right colour. They’re the lucky winners of 100.000 euros. You’ll end up in the lowest prize category with two correct numbers. Sometimes you’re not the only winner in the highest categories. In that case the winners have to share their prize money. It’s entirely up to you how much number combinations and colours you want to predict. The more numbers you have, how bigger your chance of winning. The amount of Jackpot money depends on several factors. For example, it’s much higher when there wasn’t a hit last time. The Dutch Lotto Jackpot includes at least 7,5 million euros. Every time there’s no hit 400.000 euros will be added. The Dutch Lotto thinks that the weekend is the best time for a draw. Every Saturday at 11.00 p.m. at the Dutch television channel SBS it’s time to have fun. You could also read the results on the internet or teletext. The last Saturday of the month is even more special. It’s called the ‘Lotto SuperSaturday’, and includes two draws on just one day. It’s entirely up to you if you want to participate in both draws or just one. The Dutch Lotto does not only organize a normal draw every Saturday. There’s also a special draw called ‘het Cijferspel’, which means ‘The Number Game’ in English. This is a game with six numbers. It gives you an extra chance to win money. The only thing need to do to participate is to buy a lottery ticket of 1 euros. During this number game a computer picks six Lotto numbers. You even have a chance of winning a great prize when you’ve predicted just one number correctly. Some people have won 100.000 euros or 200.000 euros in the past, but of course lower prizes are more common. You only have to share the prize money in the highest categories. The prizes besides the Jackpot, main prize and second prize always offer the same money. For example, the third prize is 1000 euros and 2 euros in the lowest category. Of course the chance of winning just a few euros is much higher than a Jackpot hit. Of course you never know if Lady Fortune will help you! She was definitely there when someone won 36 million euros in 2010. However, don’t forget that in the Netherlands you need to pay gambling tax of 29 percent for prize money higher than 449 euros. The winning chances of the Dutch Lotto depends on several factors. For example, buying several lottery tickets will increase your chance of winning. The average chance of winning in this lottery is about 1:5.7 per ticket. Of course this percentage will increase if you have more tickets. Most participants win a prize in one of the lowest categories. For example 2, 25 or 50 euros. You have a chance of 1:6,6 to win one of these prizes. Of course the chance of winning the Jackpot is very low: 1:48.870.360. You still don’t know if it will be a special day in the lottery though, because some Jackpot hits did take place in the past.